In a few short weeks, an alien invasion is coming to Starfinder—in the form of Alien Archive 2, our second book filled with intergalactic critters to populate your game, or to serve as your player characters! As the book's release date approaches, we'll share more information about what you can expect to find in its pages. For instance, a number of Paizo staffers picked up their game-design pens to create some awesome playable races, and some of these illustrious authors will detail their inspirations in their own words. Further, we'll spill some data about other player-facing rules in this tome, including polymorph rules and the new pieces of gear detailed. But for now, feast your eyes on some of creatures that you'll find in this book. 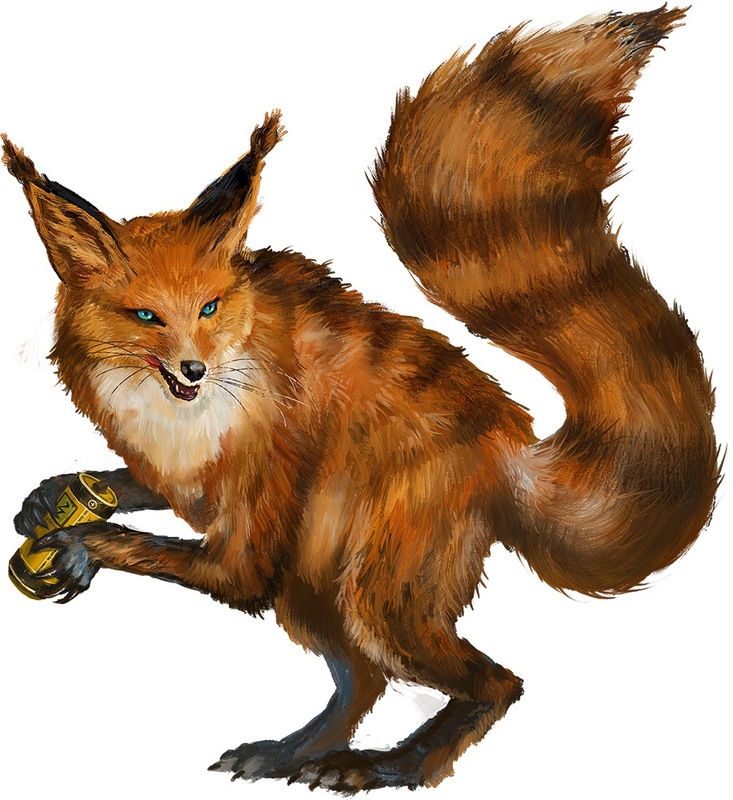 There's the squox—no, not a space fox, but a squirrel fox, as some Pact Worlders once dubbed it. The squox is a pet that, naturally, is associated with the carrier colloquially called a "squox pocket." Then there's the glass serpent, the Gargantuan beast known for its natural invisibility. Aside from its ability to sneakily devour its prey, we're not sure why a glass serpent wouldn't want to be seen. Isn't it beautiful? Finally, no new book of aliens would be complete without some more starship-sized monstrosities. 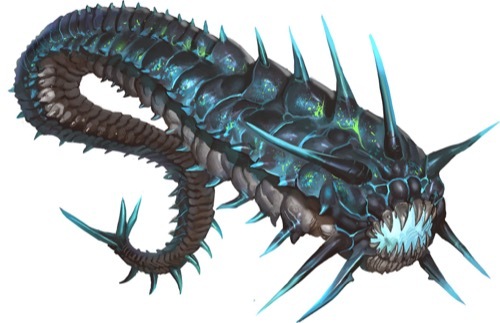 There's the vermelith, which is capable of swallowing your entire party and their hard-earned ship in a single bite. Encountering this behemoth in the Drift might be a bad day indeed. Watch this space for more Alien Archive 2 reveals, coming soon to a device near you! I was trying to convert the Quasit the other day when I realized indeed there was no polymorphing rules. Excited to see them coming! Vermelith, I didn't know I needed you. What would be the Starfinder equivalent of an Owlbear? Akata? All I know is space bears are coming. I'm all for this. Although, to tell the truth, I can't wait to pick up a copy. Afterall, wouldn't an uplifted bear be cool? "I'm gunna lick this battery!" About time we get polymorph rules and spells. Especially when there's a god of evolution. I can't make a cleric of Oras if I can't actually "evolve" anyone! Now we just need a shapeshifter class, and we're golden. - converting weapon mounts from one arc to another, such as converting the aft and starboard arcs into forward arcs. - converting weapon mounts from one step to another; ok, technically speaking, you already can. However, I'd like a rule to converting two LIGHT mounts into ONE heavy mounts, essentially allowing smaller ships to get stronger weapons, such as a Fighter-class ship getting heavy weapons. - feats that improve space combat, such as treating weapons one range better, or increasing the speed of tracking weapons. What does the squox say? Sorry I had too, I'll show myself out. Any monsters with starship statistics also have statistics when on ground in this book? 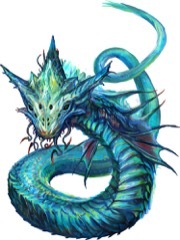 Not sure if they're going to be in the Archive, but in the second part of the Third Starfinder Adventure Path they get looked at, oh and they're known as Velstrac now. For the record, velstracs are what they call themselves, and this name came from the hardback Book of the Damned (it far predated this particular AP and isn't a new name in any way). they can now, don't they? Only medium and bigger ships can mount heavy weapons, only huge and used can mount capital weapons. Additionally, turrets cannot mount capital weapons even if the base frame can in the other arcs. I think the supercolossal ships can mount capital weapons on a turret. Yep... for a fighter ship, you must have a tracking weapon and another Light weapon in the forward arc, and little to no use for weapons for both the aft and starboard arcs (seriously, who's going to sideways?). Yes, a fighter ship doesn't have aft and starboard mounts... but the rules state that you can add them for an extra (2 mounts on each side). Technically speaking, a fighter ship and any Tiny and Small ships can have as many as 8 mounts (2 on each arc). However... again... the limitation is... well, limiting. I cannot recreate Star Wars's X-Wing, which seems to have 2 weapon mounts per side, but firing forward. Now go back to my statement about being able to convert two light weapon mounts into a single heavy weapon mount, and you would have 2 [linked] heavy weapons firing forward. Same goes with tracking weapons on its forward or back arcs. I don't want to derail this topic further, but... yeah, if aliens are becoming bigger and bigger, to the point of resorting to ship combat to fight them, new ship upgrade rules will eventually be needed. There will never be heavy weapons on tiny/small ships as a PC option. It would totally throw off the balance of carriers vs dreadnoughts. It’s not a mistake that most fighter weapons usually won’t overcome a big DT. ...for a fighter ship, you must have a tracking weapon and another Light weapon in the forward arc, and little to no use for weapons for both the aft and starboard arcs (seriously, who's going to sideways?). If you don't arm all of your arcs, the enemy is going to take advantage of those blind spots every time you fail your Pilot check. You'll get blasted again and again, and your options for retaliation would be quite limited. Considering that ship tiers work like CRs, that would make it a mistake. Also, some linked weapons will almost always beat a DT of 15. A smaller ship of equal tier to a larger ship is usually objectively weaker. Just because you can cram (say) 12 tier worth of upgrades into a fighter frame doesn't mean it has a 50% chance against a tier 12 cruiser. The HP deficit and lost BPs to match weapon mounts hurt more than the saved base frame BPs, not to mention power core issues at high tier. The fact that you can build high tier fighters that can reliably damage battleships and dreadnoughts is irrelevant to the underlying balance concerns. You'd be a fool to put sixteen tier 8 fighters into a carrier rather than build sixteen tier 8 destroyers. Ship combat and build efficiency is designed so that carriers can usefully provide a bunch of weak fighters who aren't worth the efforts of most larger ships to target (and can't be hit at all by the big capital weapons), but have individually low chances to hit and low chances to do damage against the really big ships. They can swarm small escorts and chip away at big ship shields to give an assist, but that's pretty much it. If a fighter were built to be dangerous, it would get focus fired and killed in short order because it can't carry enough PCUs to support both good weapons and excellent shields, can't have enough crew to repair it, defend it, and rebalance it's shields, and can't have HP to soak up the hits. If you want to house rule this to support your fighter fantasies, go ahead. But Paizo is building a system that (1) supports a single ship manned by a party of adventurers and (2) is plausible within the context of their world and designed naval organizations and balance of power. Fighters taking down dreadnoughts is not consistent with either of those concerns. Pretty much every time I see 3d warfare, I see bombers. From WWI pilots dropping bricks and flechettes, to a Y-wing running the Death Star trench, to a dragon, high-mobility high-damage builds are a major part. Are they usually pretty fragile? yes. Does this make them a poor choice for PCS? yes. But the reason interceptors exist at all is because otherwise the first person to strap some engines to a big-*** gun is going to do some serious damage with a lot less drain on building materials and personnel than their target. To me, "plausible within the world" is likely going to imply the existence of low-rescorce glass cannons. At the moment, those are absent. Amazing fighters, I can take or leave (though their analog in melee of evasion-focused characters should at least still be around for fantasy reasons). But I feel we need viable bombers. Edit: and you don't even need a third dimension, since I might as well be describing gunboats too. Fighters with Tactical Nuclear Missile Launchers and intercepters with turreted linked Coilguns are the most you're going to get, and they're already here. What you really should see in professional navies are CR 3-5 pilots in those tier 2-3 frames, pushing up their to hit and defenses without BP expenditure. EMP bombers for attacking big ships with depleted shields also make sense. You're just stating the issues with the balance of starship combat, which is nothing new, but this doesn't write off that tiers are meant to represent CRs, just like how creature scale combat works. They use the same amount of BP that a much bigger ship uses, and should, in their own way, be balanced with other equally tier starships. I don't know what you think Paizos agenda or intentions are, in this regard, but the game as written doesn't seem agree with you. That'd be like if a CR 20 colossal monster gets to be better than a medium sized CR 20 because it's bigger, and that's not what CRs, or tiers in this case, are meant to represent. That might be true, Sauce987654321, if not for the size limitations imposed on small ships. They pay less for their upgrades than larger ships do, since they don't have to worry about those pesky size modifiers to BP costs, but they're ultimately capped on what they can and cannot put on their ships. Yeah, I think equating tier with CR doesn't quite work. They tend to work out like class level in pathfinder. The tiny tier 20 is like a lvl 20 commoner. the tier 20 dreadnought is like a lvl 20 wizard. Technically all similar CRs rules as written, only one of those might challenge a level 16-17 party. Ship class needs to be factored into tier. A fighter with tier 20 BPs, is still probably only a tier 14-16 threat. Honestly, for my own use I don't think I'll ever stat out a small ship higher than tier 10. I also think if the PCs split into multiple ships it's a good idea to split their encounters into multiple enemies... even more work on the GM. At least I enjoy starship combat as written. Paizo isn't great at creating a consistent CR system, film at 11. I think the azlanti drone carriers is probably the right way to go with the system. Allowing you to flood an area with drone fighters that are dangerous enough but basically expendable assets. By themselves they are not that deadly but if you can flush your racks of 10 or 20 of them thats a LOT of extra forces to nip at weak spots and swarm smaller warships. The drones are negligible on their own, the ability of a science officer to use his (very, very high) computers skill in place of their gunnery check is what makes them dangerous. Note that, in setting, space navies do not use the BP system. When they have to deal with matters of cost, they have to deal with actual monetary cost. So, why build 12 Tier 10 fighters rather than 12 Tier 10 destroyers? Because those Tier 10 fighters probably cost a lot less than *one* Tier 10 destroyer, even moreso when you take into account crew. Nonsense. BPs exist to prevent conversion into cash for personal items, but there's no reason to think they break all transitive relationships between the relative cost of items. If an item costs 10 times as much BP, it should cost 10 times as much "real" resources as well. We can know that non-PCs don't get cheap tier 10 fighters because no one builds tier 10 fighters. They face the same trade off in effectiveness and size regardless of on paper tier and resources invested, and they choose to go up ship size/base frames in consistent tier intervals. And where are they getting the crews for their exclusively-capital navy, again? The same cheap labor source available to PCs, at rates printed in Armory. Scrubs are cheap, only officers cost money. Fighters and interceptors have to be crewed by expensive officers, so they don't save as many labor costs as you'd think, especially if they are high tier. I didn't say anything about exclusively capital ship navies, destroyers and explorers would be a lot more common, and cruisers a lot more common than battleships, carriers, and dreadnoughts. I'm just saying high tier fighters are a dumb idea and a bad investment. Medium-to-low tier shuttles and light freighters are a better idea, since they can at least seat more crew, fire more weapons more accurately, boost shields, and use science officers to suppress enemy defenses or focus your offense. Crew would cost them somewhere around what they would make in a profession check. Plus other expenses and perhaps combat pay. Starships are assumed to cost on a scale that would buy PCs a whole bunch of tier 20 equipment. Possibly upward of millions of credits for a tier 1 fighter. Crew pay is unlikely to be on the same order of magnitude of the cost of the craft itself. That said, it's still likely prohibitive. Nothing to sneeze at. Mobilizing a crew of thousands and supplying them takes time that sending a small cruiser or drift capable fighter out does not. Also, the pactworlds is very obviously not a capital only navy. Low tier ships used as scouts/harassment/interceptors/bombers tend to be the small and tiny sized vessels. High tier ships tend to be big cruisers, carriers, and dreadnoughts. Think of it like this: you have X BP for a fleet. They can build a dozen tier 20 dreadnoughts and win any tactical combat. But the guy who builds a half dozen tier 20 dreadoughts, and 40 tier 9 cruisers and 60 tier 3 explorers and fighters can cover/defend more locations, attack in many places, and loses much less capital when he loses a fighter. If you have to defend a solar system, and not just your own fleet, one of those navies is much better suited to the task. Granted... yes... that would be a bad idea to leave the arcs unarmed. However, it makes more sense for bigger ship which cannot turn on a dime than on smaller ships which maneuver much quicker. That's like saying that my PC should hold a gun in his off hand to be able to shoot sideways because he "cannot" turns and shoot with his primary gun which he shoots a bad guy in front of him on the previous round. If a fighter has to move first in the piloting phase there is a VERY high chance that the opponent with any kind of reasonable speed and maneuverability acting last will be able to get in its side arcs and bring to bear its own favored weapons, making the fighter completely unable to shoot in the gunnery phase. I don't think side arc weapons are smart for fighters but multiple fighters supporting each other are. So are flyby attacks if you lose the piloting check and have to act first. I agree with Metaphysician in this case. It's the only way the system makes any sense. This system of abstraction is literally designed to divorce the player characters and their ships from the traditional wealth system to preserve balance and avoid paperwork. As an abstract system, it doesn't really need to line up with anything. Millions is probably an exaggeration. I don't think the game actually says that. You could buy yourself an Ultimatum Hovercarrier (fluffed as the pinnacle of military technology) with that kind of money. It's difficult to pin down a credits to dollars ratio. Even harder to figure out a price for a starship. The only comparison I can find is a tier 1 computer for 50 credits, which is the equivalent for a smartphone, so between $400 and $1000. The old F14 used to cost the US ~$38 mil. An F35 is projected to cost $85 mil. 747's used to go for $24 mil, and the modern versions are sold for about $380 mil. A newer model Cessna is around $200,000-$300,000. And old used one is more like $40,000. A 'cargo ship' costs somewhere in the $30 mil range, obviously this is highly variable based on type and size. Cruise liners for instance are probably in the hundred million range. A player's starting credits at Lvl 20 is something like $4 mil. Obviously credits seem to have a much higher purchasing power, and economies of space based superpowers are vastly different compared to the real world. It can only be a gut feeling, but I think anything starting above tier 3 is outside the purchase power of any PC following the wealth by level, even at level 20. I think a ship based weapon is probably orders of magnitude more expensive than any infantry portable weapon - a modern aircraft cannon (or ship cannon, which is probably a better analogy with anything bigger than a small starfinder starship) is waaaay more expensive than an infantryman's assault rifle or lmg. Starships are so powerful that they barely even have rules for infantry weapons to attack starships (even though in the real world infantry do have weapons for attacking aircraft and small ships). Things being the pinnacle of military technology only realistically make them expensive compared to other things in their own category. The adaptive combat rifle from bushmaster (which is a fairly advanced assault rifle by today's standards) was suggested to have a retail price of about $3000, while prices for ww2 and soviet era tanks are still in excess of $100k, and for a more modern example that doesn't as much historical value - the A10 warthog, which is very close to retirement, has a unit price of about $18 million. Even the most advanced infantry weapon in the world won't be worth as much as a 30 year old aircraft, because of the sheer difference in scale of the two things. I'm basically comparing two vehicles, one of which is a low end, seemingly common starship, to the current strongest vehicle in the game that's also the size of a huge starship. So I'm not really making a random comparison. The point I was going to make is that you're going to get infinitely more mileage with the carrier than a common starship. You can easily destroy most encounters in the game with the carrier, where as a starship just lets you travel in space and participate in starship combat, in comparison. So really I don't think a tier 1 starship has any business being that expensive. The weapons in the equipment charts are creature scale, not necessarily handheld. These are the same weapons used as main weapons for tanks, fighter jets, and all forms of artillery for "ground" combat, including the carrier I brought up. Meanwhile, if a ground vehicle wants to destroy the airlock door of the starship (just the door!) it has to do 160 damage to a hardness 35 object. A 10-foot section of the starships bulkheads has a hardness of 35 and 2,400 hp.